In a pan over a stove, melt 3 tablespoons of butter and fry the gnocchi in it so becomes a light golden colour. Take gnocchi out of pan and set aside. Put remaining butter into pan along with raisins and pinenuts. Stir through until butter begins to brown. Add the juice of half a lemon to the pan and continue to stir. Add the gnocchi back into the pan and stir through until well combined. Take off the heat. Roughly chop parsley. Add half to the pan and stir through. 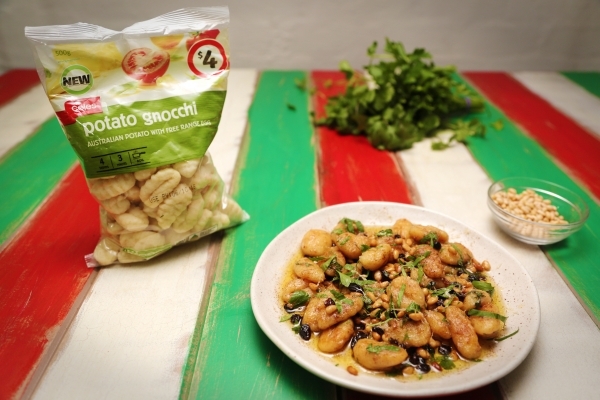 To serve, pour gnocchi onto plate and top with grated Parmesan and remaining fresh parsley.